India, the outsourcing capital of the world offers services from software development, to photo editing, to engineering and research to global companies across the world. Today, you can outsource almost any service to India. However, finding the right vendor in India for your business can be a daunting task if you are new to outsourcing. The success of an outsourcing project depends on how well you can manage the process before and after signing the outsourcing contract. While outsourcing to India, many companies opt for the lowest bidder without undertaking a complete vendor selection process. When you do not have the right vendor, you will soon experience bad customer support, poor quality or even missed delivery dates. Going through all the phases of a vendor selection process can ensure success in your outsourcing venture. The first step towards selecting an Indian vendor is to analyze your business requirements. After the task of searching and selecting a prospective Indian vendor, you must develop a contract negotiation strategy to avoid contract negotiation mistakes. Here are five steps to help you choose the right offshore vendor from India. It is important to first analyze your business needs before you even begin to search for a vendor in India. Assemble a vendor selection and evaluation team who would be given the responsibility of finding a suitable vendor from India. Discuss with your management and vendor selection team about what your company wants to outsource. Define in writing, the service or the product that your company wants to outsource to India. Once your company has finalized on what should be outsourced, you have to define the business and technical requirements that the outsourced service /product would require. Finally, decide on the requirements that the prospective Indian vendor should have. Ask your management team to analyze all the requirements and create a final document stating your business and vendor requirements. With clearly defined business and vendor requirement, your vendor selection team would be able to easily find a suitable vendor in India, who can deliver the service /product that you wish to outsource. Ask your team to compile a list of possible Indian vendors, but remember that not all vendors would meet your requirements. After conducting interviews and researching on suitable vendors’ background, you will have to select a few vendors from whom you would like more information. Your vendor selection team can then write a Request for Information (RFI) and send it to the selected vendors. The next step would be to evaluate the responses from the vendors and create a short list of Indian vendors. Now that you have analyzed your business requirements and shortlisted a few Indian vendors that you wish to evaluate, you have to write a Request for Quotation or a Request for Proposal. The Request for Proposal should contain sections, such as, submission details, an introduction and executive summary, an overview and background of the business, detailed specifications, assumptions and constraints, terms and conditions and selection criteria. To begin with, conduct a preliminary review of all your vendors’ proposals. The next step would be to state your business requirements and the vendors’ requirements. Discuss with your management team and assign an importance value for each requirement. Next, assign a performance value for each requirement. Now all you have to do is calculate a total performance score and choose the winning Indian vendor. Creating a contract negotiation strategy is the final step in the Indian vendor selection process. Rank your priorities along with alternatives. Clearly define benchmarks and time constraints. Evaluate your risks and liabilities. Also state the level of confidentiality required. Remember to mention changes in the requirements. Understanding the difference between what you want and what you need, from the outsourcing contract, can help you create a better strategy. Outsource2india is one of India’s leading vendors offering varied services such as, customer support, data entry, transcription, accounting, research, REO services and mobile application development amongst others. You name the service and Outsource2india can provide it at half of your current operating cost. Quality services, fast turnaround time, low cost services, use of the latest technology and skilled resources make Outsource2india stand apart from other Indian vendors. Outsourcing to Outsource2india is the best decision that your company can make. Contact us with your requirements and we will get in touch with you in less than 24 hours. 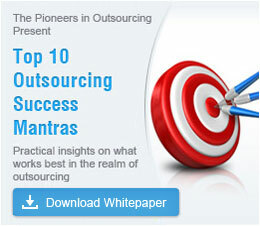 Find why world prefers India for outsourcing. Is it Low-cost labor, English fluency, stable government or more.